Those of you who have read this blog for a while KNOW how absolutely giddy I am right now. Bonnie is going to tell a story! It doesn't get any BETTER than THIS! It's what I wait for and I have NEVER been disappointed. 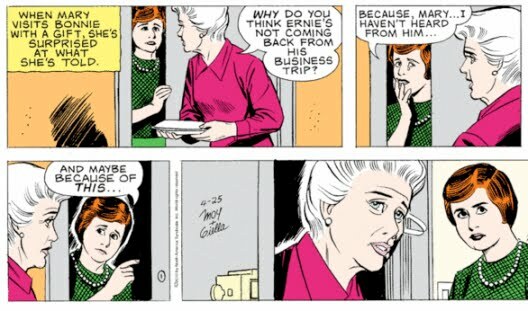 Was I disappointed when Mary Worth told Adrian Corey a story about the Mysterious Man who got away, leaving her stuck to date Adrian's father? Was I disappointed when Lynn Griffin told Mary Worth why she passed out on the ice after seeing a picture of her friend who had died? ... or when Mary explained the origins of her compulsion to help others? I hope and pray that Bonnie's story is about growing up so poor that she has been on a spending blitz ever since she got her credit card. That way, Mary can re-tell the Compulsion to Help Others story about how she grew up poor as well, but instead of going on a spending blitz, she's been meddling in everybody's life uncontrollably. 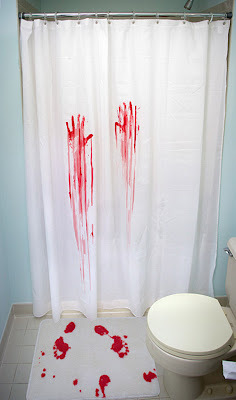 Then we'd get two stories: Bonnie's, and the repeat of My Compulsion to Help Others. It would be like a bonus. Oh, this is going to be WONDERFUL! Birmingham has it in for Mary Worth! 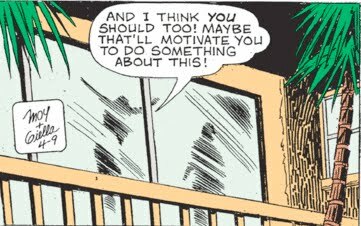 A special thanks to loyal readers Brian and Nathan for letting us know that Birmingham, Alabama, is pitting Mary Worth against Judge Parker in the ultimate blood sport: "Which Comic Should We Kill?" 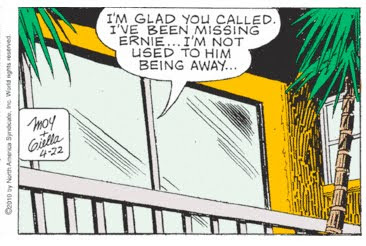 Judging by the comments section, Judge Parker is winning handily. We all know that Mary Worth is way more funny than Judge Parker, so if you want to help keep Birmingham's funny pages truly funny, you need to get out the vote. 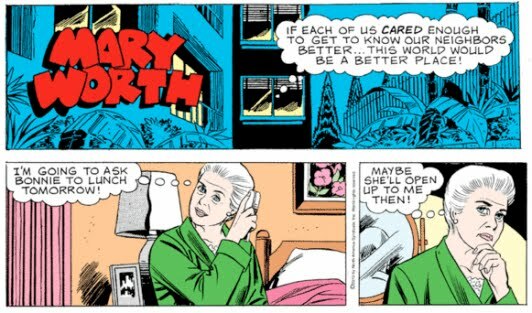 Tell them "Mary Worth and Me" sent you. 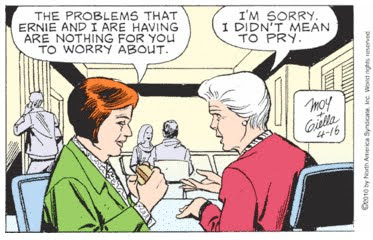 It's so out of control that Mary Worth is peeling off her Sweet Old Lady face to reveal her Inner Maniac face. Look out, Bonnie, you're about to be Meddled. Front Door and Back Window have had a very tumultuous relationship over the years. 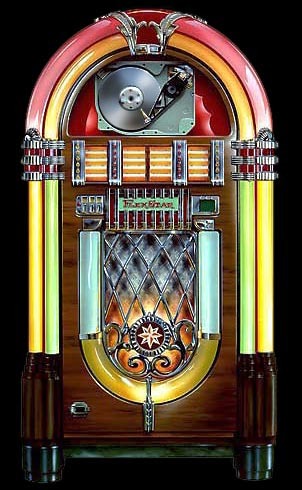 I remember a time when everything was blissful, and Front Door thought the earth revolved around Back Window. But then, along came Ceiling Fan, stealing Back Window's heart for just a couple of nights, but that was all it took. 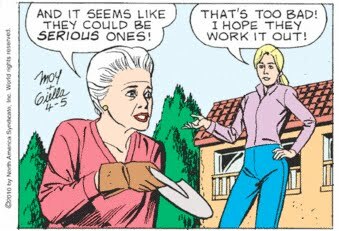 So many marriages could avoid the Final Parting, if only Mary Worth's Oven would come by for a visit and bring a pie with an automobile piston baked in the center of it. I'm so glad you called. I've missed Ernie's sombrero. What the heck? This is literally the fourth time we've seen this exact picture, although this time a little White-Out has removed the Mexican statues. I am DYING with curiosity. 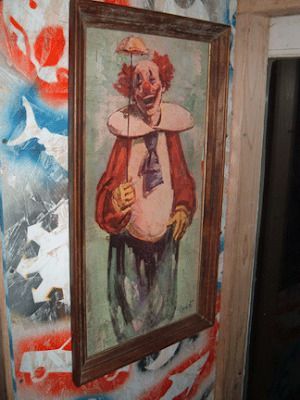 What is in that apartment that is so horrifying even the Great Joe Giella refuses to draw it? A few days ago, loyal reader Michael wrote to suggest that we may never see the insides of the Johnsons' apartment because it is so full of the junk Bonnie is hoarding. He may be on to something. There seems to be barely enough space for the Johnsons' thought balloons to squeeze out the back window. Mary is so smug, so judgmental, and yet, Toby, who knows a little bit about exceeding her limits, is truly disappointed. Just wait until these two nosy busybodies dig up Bonnie's credit rating using that web site Terry Bryson told them about. You won't be so lackadaisical then, will you Toby. Let's have a second cup. Don't worry, it's Sanka. And a HUGE thank you to Scott for our new header! Bonnie's credit card is not the only thing that seems to have had a good work out. Bonnie has lost at least 40 pounds. 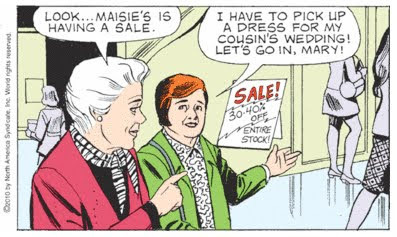 Mary Worth and Bonnie stop by Mrs. May's Cookies, which happens to be precariously perched on some sort of dangerous ledge overlooking Moysies Department Store. This made me think of our own local mall, which a year or two ago lost our favorite shop, Mrs. Fields Cookies. We still mourn. It was such a heartbreak. 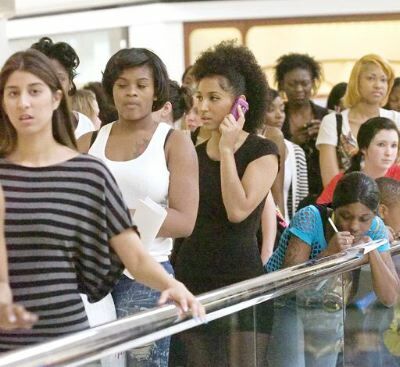 Last week, Mrs. Wanders and I were wandering through the mall, wishing we could have some butter with flower in it, and came across a line of young women who had been waiting all day to audition for a television show, I think called America's Next Top Model. There were hundreds of these women, all dressed very much alike, most wearing tank tops and high heels that were way too inappropriate for standing in line. Our local weekly put together an interesting package on the event. Most of these young women seemed so hopeful, so full of dreams. They had to be living in a dream world to make it through the hours of waiting. But what they were waiting for, I don't think I can ever really understand. I may have this entirely backwards. 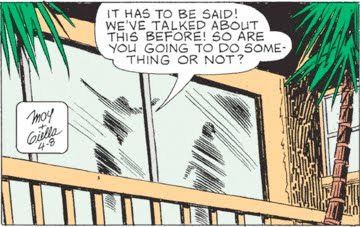 Mary Worth is the one who has already admitted to her compulsive behavior. 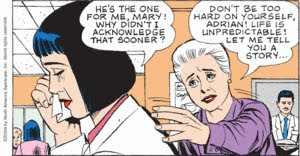 This may be all about Bonnie's efforts to help Mary Worth by never giving in to her meddling. Let it go, Mary, and eat your hamburger. 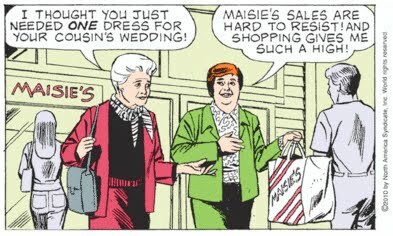 At least we didn't have to sit through three weeks of Bonnie trying on dresses at Maisie's. Although that could have been funny. Bonnie may have trouble with compulsive shopping, but that guy with his arm in her bag must be a kleptomaniac. 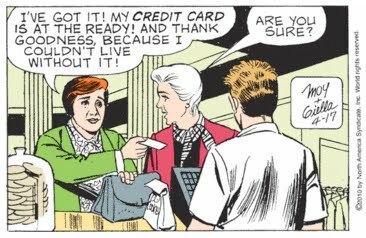 Mary Worth should introduce herself and invite him to Santaroymart where I understand they have a lot of crime. See if he'll get high pinching boxes of Nilla Wafers. I know if you want to catch me in a trap, bait it with Nilla Wafers. They're hard to resist. I love 'em. Especially in banana pudding. I am impressed by Maisie's clapboard facade. Yesterday, I posted a store directory for the Santa Royale Shopping Center, but no map. I received dozens of emails, "Why no map?" Today's strip explains why. I defy anyone to map this mall and locate that sign. Is it in a window? Floating in the air? 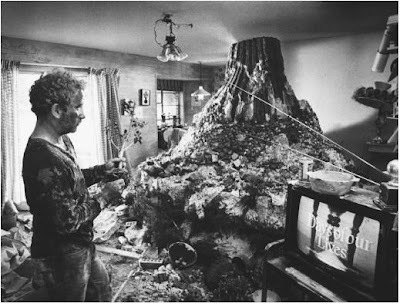 The fifth dimension? You just can't map the Worthiverse. 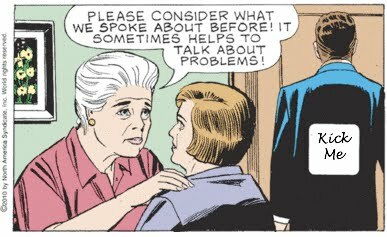 Mary Worth: making the world a better place, one victim at a time. 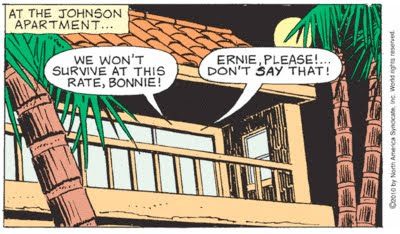 Oh, who is this mysterious blond interloper, trying to usurp Mary Worth's role as chief meddler in Bonnie Johnson's life? Don't even try, lady. 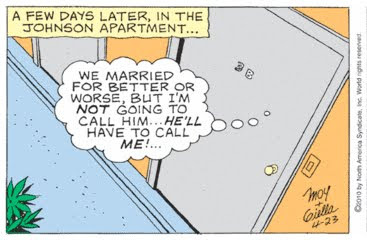 Mary Worth has already got this situation well under control. Meanwhile, absolutely nothing has changed over at the Johnson's sliding glass door. Absolutely nothing. Joe Giella must be extremely proud of this drawing to use it three days in a row. Perhaps he's hoping it will receive a Worthy Award. Can you really blame Uncle Joe for recycling his art when the dialog is largely recycled as well. But I know what Señor Erñie means when he yells, "Do something," at his wife. I spend a lot of time yelling "Do something!" 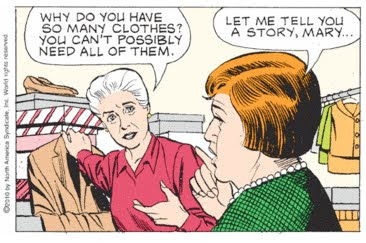 at Mary Worth's characters myself. I know what Ernie means. My credit card has the worst interest rate. But all the Johnsons need to do is call Chaste Bank and ask for a lower rate. Problem solved. On to the next story. 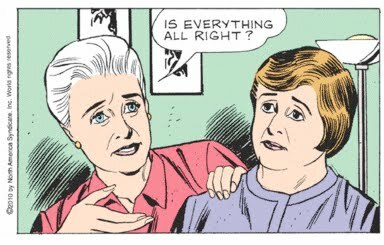 Oh, Mary Worth, please tell us how to avoid the inevitable Final Parting. After all, you've known so many couples. Is it a secret mystical tea brewed from the blossoms of your magical morning glories? You are a woman driven, driven to defeat death, to boldly bypass the Final Parting. 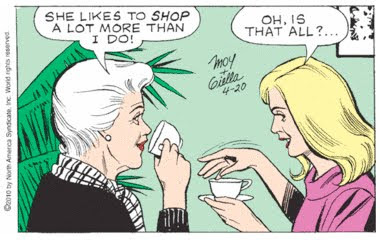 The dark arts may intimidate some, but not Mary Worth, nor her evil pruning shears. 1) The Johnsons are nice, polite, and quiet. 2) They like Mary Worth's cooking. 3) They have some sort of problem with their marriage. 4) Without Mary's intervention, the solar system will implode. Maybe if you baked something for them, Mary, and took it to their apartment, Bonnie? Bonnie Johnson? would open up to you. Did you notice that she likes your cooking? Zombie Mary's eyes literally glaze over as she smells the blood of serious problems over at the Johnsons' apartment. Her wrist goes limp and she nearly drops her trowel of doom. Meanwhile, Toby Cameron, the ever present voice of reason ("I think I'll retile the kitchen floor tomorrow,") subtly tries to suggest that the Johnsons might be best off solving their own problems. Oh, Toby, you dear little dimwitted fool. Don't you see Mary's trowel? 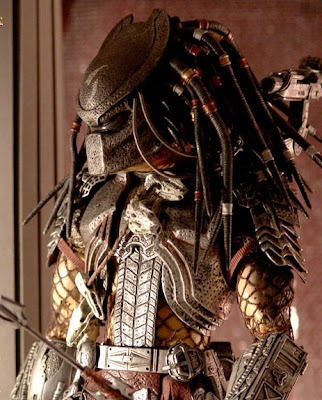 She's not going to stop until the Johnsons are planted snugly in her garden bed of victims. May I just add a note on how much I enjoy everyone's comments and emails? Each day we get about 300 visitors here at Mary Worth and Me. I know those aren't staggering numbers for the Interwebs, but when you consider the subject matter, I think it's pretty darn amazing. I appreciate that people stick with the Family Friendly format of this blog, and that many of you have actually signed up to become citizens of Santa Royale by following this blog (if you haven't joined, you're still invited. You wouldn't want to turn me down, would you?). Also, a reminder to newcomers: Don't forget to hold your cursor over the images for your free secret message from the Santa Royale Condo Board. I hope everyone is having a beautiful spring. Now, I'm off to Opening Day with my son to watch the World Champion Philadelphia Phillies play a baseball game with my beloved Washington Nationals. Well, as I said yesterday, this is the part where Toby and Mary drink coffee. But it isn't that Mary Worth stories follow a predictable formula, it's more that these characters are so well developed, and their relationship is so defined, and we are so stupid, that we need Mary to explain everything to Toby so we can know what happened while we were busy reading Mary Worth this week. Run, Bonnie? Bonnie Johnson?! Run and never look back. I don't care if I never learn why you seem so glum. It's a sacrifice I'm willing to make to save you from the evil clutch of Mary Worth. But, alas, we both know that it is too late. After Mary drinks some coffee with her evil henchwoman Toby and talks about her observations, Bonnie? Bonnie Johnson? is going to come knocking and all will be lost. As long as I live, I will never forget the look of wretched horror in Bonnie? Bonnie Johnson? 's eyes as she realizes her fate. There's nothing like First Contact. The feeling of anticipation that has been lingering for several days as Mary Worth set her sights on Bonnie? Bonnie Johnson? is finally consummated with the The Touch. Now Bonnie? Bonnie Johnson? is hers and hers alone, a submissive puppet in Mary's hand. I'm going to enjoy this. I'm going to enjoy it very much.